Many children wonder why their parents insist on nightly bath-time. Bathing, to a child, seems to be a pointless endeavor; after all, we will be getting dirty all over again tomorrow. But what if we decided not to bathe for a few days? What kind of unfortunate results could occur? When a little girl chooses to forego bath-time, peculiar things start happening to her body. 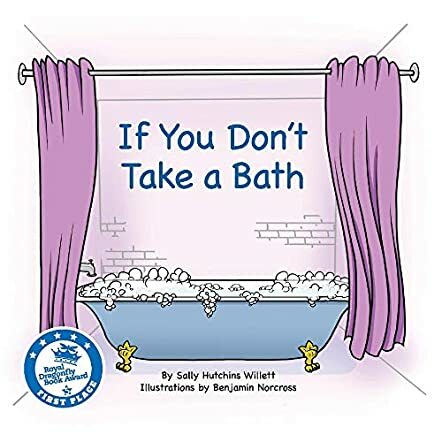 If You Don't Take A Bath by Sally Hutchins Willett is a fun children's story about what can happen if we don't take a bath. Maybe your hair will tangle and get so dirty that animals might start moving in, insects may start crawling on your arms, and tiny bugs might just hop from knee to knee in happy glee. Before you know it, things might begin sprouting from your arms and between your toes, and certain slimy things might choose to wiggle along the tip of your nose! So, if you cling to dirt like it is a part of your body, maybe you should read this story; then maybe, just maybe, you may take a bath! If You Don't Take A Bath by Sally Hutchins Willett combines colorful illustrations with an engaging story. I fell in love with the little girl and sympathized with her. As a child, I hated bathing because I didn't like getting wet. As an adult, I admit to spending desperate hours chasing my screaming child around the house as he frantically tried to escape nightly bath-time. This book is an excellent tool for encouraging kids to part from their newly acquired layers of dirt and bugs. The story also works to shine a humorous light on the situation for the despairing parent at the end of their rope. After all, what is the worst that can happen if we let our kids go a couple of nights without a bath?